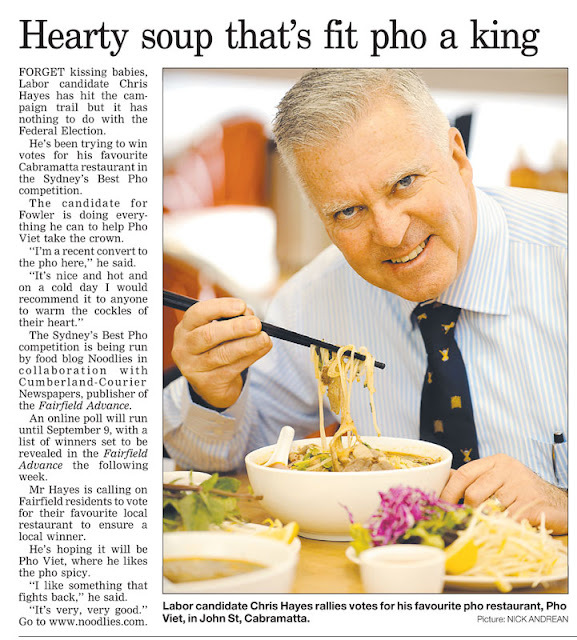 Candidate for Fowler (which includes Cabramatta) votes for his favourite pho in Noodlies Sydney’s Best Pho search! Fairfield Advance, 18 Aug 2010. Your pho competition is really getting somewhere!! Happy to hear that! I saw one of your posters at a restaurant too, hope it goes well! I'm still a regular at Pho 54 after 20 years! Hey Bette, good choices, they are both getting a few votes too.